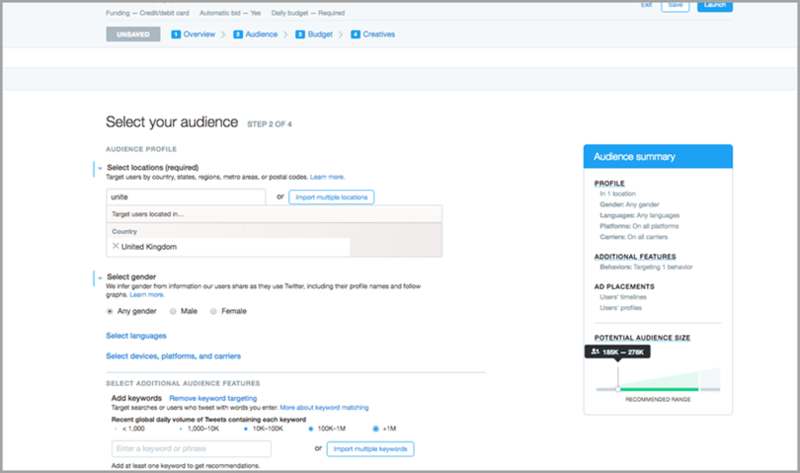 Facebook Vs Twitter Advertising: Where Should You Invest? You go and create this amazing strategy for marketing on Facebook and Twitter. Your following is growing. The engagement is flowing in. You open up Google Analytics to find that the web traffic from each channel is rocking and rolling. Hey look, some conversions too! All is well in life as a social media manager. All of a sudden, you notice a drastic drop in impressions and engagement on Facebook. The web traffic slows down. You wonder what happened to all your social conversions. You learn: Facebook made another one of its famous updates – another algorithm change that brought organic reach down to 1 to 2%. And with Twitter, well Twitter never showed every tweet to a page’s followers, so it’s no surprise to see your numbers gradually going down hill there. Twitter impressions and engagement have never really been that high to begin with – if you got a few each week along with some clicks to your website, you were happy. With tweets only having a shelf life of about 60 minutes, what could you expect? It’s quickly becoming a “pay to play” marketing world. You’re already spending time and money managing Facebook and Twitter and now you’re being told if you want your content to get seen, you need to spend even more money by adding social media advertising into your marketing mix. When we first heard about this at Click Intelligence, we were disappointed. Our clients were already paying a retainer to have us manage their social media and now we would need to tell them they need to spend even more. We were probably one of the slower digital marketing agencies to hop on the social media advertising bandwagon due to our skepticism and when we did, we treaded very carefully. 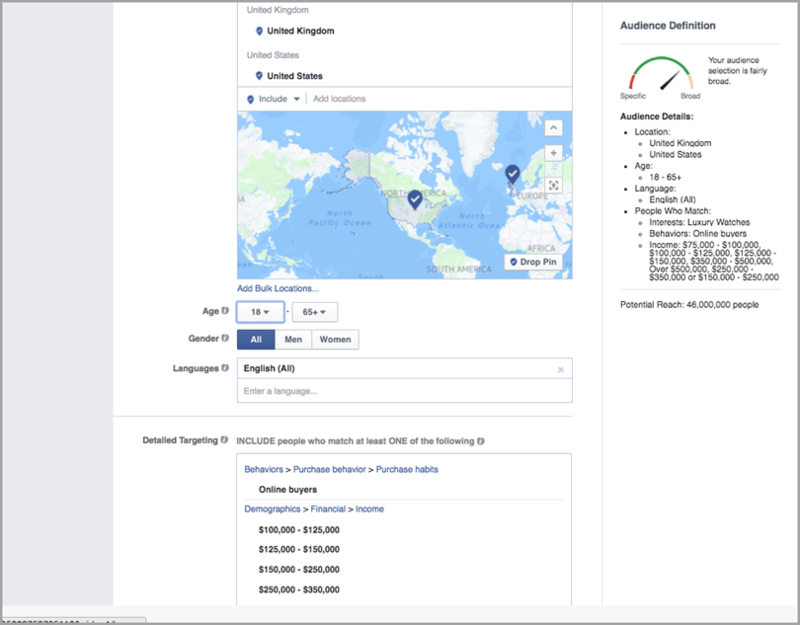 We’ve now been running Facebook and Twitter advertising campaigns for clients in various industries from the UK to the US and we’ve learned a few things along the way. Before you invest in advertising on either, consider the following. Facebook Advertising allows users to reach millions of people. Here’s what came up when I ran a broad test to reach lawyers in the United States. One of the features of Facebook Advertising that turned us into fans was the targeted reach it offers. We were able to narrow in on our clients’ ideal audience. Since its launch, Facebook Advertising has only become more advanced. Today, we can narrow down everything from salary, purchase behavior, life events, and so much more. Let’s say you sell luxury watches online and you ship to the United Kingdom and United States. The watch prices start at $1,000. Your typical average Joe can’t afford them. No problem. 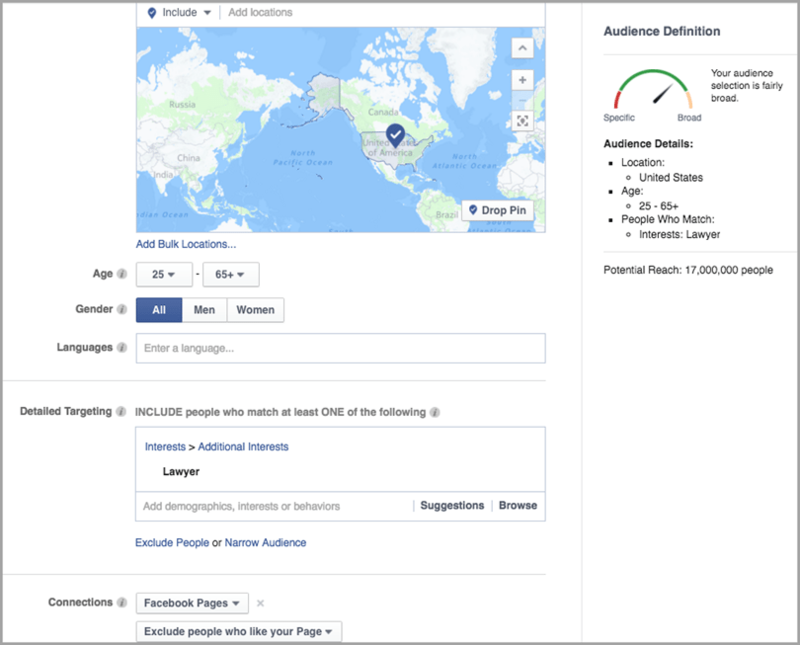 Here’s what your targeting might look like. Not only can you reach prospects through targeted reach, but you can also reach people who already follow your company page, in addition to their friends. We’ve ran campaigns for as little as $2.50 a day. Facebook gives users a great deal of flexibility in pricing. You don’t have to spend a fortune. The only real con we have to point out is the fact that you do have to pay to play. While $2.50 a day might not seem like much, it can be a lot for small businesses. Like with Facebook Advertising, the first two pros overlap. Twitter Advertising offers greater, targeted reach. It’s not as advanced as Facebook Advertising in terms of targeting (and if it is, it doesn’t show it).Facebook Advertising knows and uses all … where you sleep, where you eat, what you eat, if you have kids … Facebook is stalking (most) of you – watch out. Facebook Advertising is easy to use. Setting up and running ads on Twitter in my opinion, is not as user-friendly due to the way the system is set up. With Facebook Advertising I can type in whatever I want. With Twitter Advertising, there are some extra steps that need to be taken in order to get the targeting on point and I can’t always find what I need. Despite targeting my campaigns as well as Twitter Advertising will let me, I get more spam accounts following the accounts I advertise from because of the ads. If they are not spam, they are rarely prospects. 3. Holy credit card … Twitter Advertising is expensive! Where I would pay $1 per click for a Facebook ad I would pay $5 on a Twitter ad. Twitter Advertising is much more expensive. When all is said and done, Facebook Advertising gets my vote 9 times out of ten, but I encourage you to explore both starting off with a small budget. While we’ve had much better success with Facebook Advertising, we’ve been able to get some traction with Twitter advertising too, including follower growth and website traffic that has not all been irrelevant. If your business is brand new to Facebook or Twitter, you might be tempted to quickly begin advertising. Many people I speak to think this is the route to take because their pages start out with zero followers and they could just run campaigns to get new followers – ‘buy followers‘. Bad idea. Some businesses have success building their pages organically. Save yourself the money. Build a foundation first. Have you done everything you can including using Jeff’s tips for increasing fan engagement on Facebook? How about Jeff’s tips for driving a ton of free traffic with Twitter? Create and share amazing content on your pages. Use hashtags. Engage other users. After you’ve established a foundation, use Facebook and Twitter advertising to supplement your efforts. Earn your followers, engagement, and web traffic before you essentially buy it. Why you want to advertise – what your goals are. How much time and money you can spend. What you’ll promote and when you’ll promote it. How you’ll measure your efforts.